Our professional translators are competent linguists with skills to translate from foreign languages into native language and from native into foreign languages. The translation process can be very complicated and may require subject-specific knowledge. All our translators are experts in their own domain. Their work ensures quality translation, proper terminology, grammar and sentence structure. For all your translations into and out of Serbian, we will make sure to assign a competent translator who is a subject-matter expert. We guarantee high-quality, natural sounding translations and fast turnaround times. In addition to English, German, Italian, French and Spanish, we also have a pool of both regular and certified (sworn) translators for a large number of world languages. We have – at mutual pleasure – established business relations with many national and international companies, several ministries and banks. We say "mutual" because, after the first project, our clients tend to come back, and for us this brings further pleasure in the work we do and makes our professionalism show in our services. Our employees are either linguists with degrees obtained at the Faculty of Philology or competent translators with academic training and many years of relevant experience in their field. They are all professionals when it comes to the work they are doing and specialists in a particular domain. After translation, the texts are carefully read and revised to sound natural in the target language. This ensures the best possible translation quality. 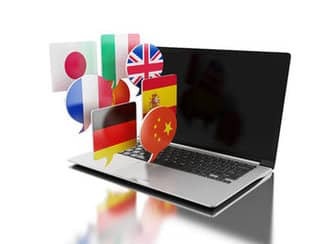 In order to provide quality translations, in addition to our team of translators, we frequently rely on the services of our external associates who have built an excellent professional relationship with us. Our services include certified or non-certified translations, general and specialized translations, including legal translations, finance translations, medical translations, business translations, etc. You can also contact us if you want your website translated. We guarantee a competent, understandable and accurate translation with proper terminology. Popovic Translation Company always takes care that the translations are completed on time and ensures full data privacy. Aiming to satisfy our clients' high expectations, we hire only responsible professionals with proven experience in translation business. We also guarantee a professional attitude to work and extremely respectful relationship with you. With our quality assurance standards, competence in all domains, strict adherence to deadlines, extremely competitive rates and reliability in data privacy, accompanied by almost two decades of experience, you can rest assured your translation project will be flawless. Our translation company relies for translation services only on translators specialized in their area of expertise (domain competence), e.g. finance, banking, law, technology, medicine, business, general texts, etc. We also proofread your texts at your request. After that, a native speaker reads the translation and makes sure to arrive at a natural-sounding target text so as to achieve the highest translation quality. We translate general texts, specialized texts, medical texts, technical texts, books, personal documents, etc. You can contact our translation company for all types of translations. Our translations are prepared by highly educated professionals with the most sought-after specializations. We stick to the uncompromising attitude when it comes to quality and this is how we retain our clients. You are welcome to ask for our references in any subject-area and we would be happy to deliver you some examples of our work. We are ready to tailor our translation to your demands and your terminology. No matter where you are, all you have to do is to e-mail, fax or mail us your documents or call us and say your deadline and you will quickly receive a quote from us. If you accept our terms, we will start translating. We take advantage of modern technology (computers, internet, e-mail, SMS). You can also visit us directly at our office or we can come to you for the documents. We are ready to deliver the translation in any form that works best for you (hard-copy, e-mail, etc.). We are also a flexible and ready to go out of our way to make all our clients happy. We offer discounts on the basic translation price for our regular clients and for large projects. All our translators are seasoned professionals with superb language skills and full comprehension of the source text. We are members of the Serbian Association of Scientific and Technical Translators.